Samurai sword history dates back to over 1300 years ago, which is roughly divided into four main periods - Koto (the old sword period, pre 1596), Shinto/Shinshinto (1597 to 1876) Gendai (1877 to the end of world war II) and the modern period known as Shinsaku. The first Japanese swords were basically variations of the Chinese Jian ( chokutō / 直刀 ) - a straight doubled-edged iron sword. There is a lot of evidence the Katana was introduced to Japan from China, although in a early form. Initially the first curved Japanese swords were curved at the tang only. But fully curved swords were commonplace at the end of the 10th century. It was during this time that Japan began to abandon such close cultural ties with China, it's society stabilized into class divisions. 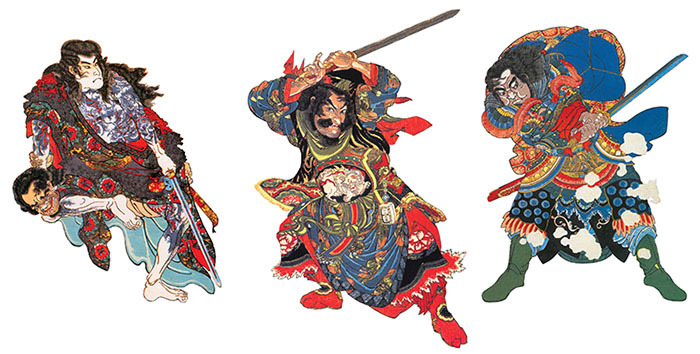 As a result, the military warriors who were guarding the society became the first Samurais. Japanese myths consider Amakuni as the “father of the Samurai”, a swordsmith who greatly improved the design of the katana. According to the Amakuni legend, the emperor was distraught about his warriors returning from war with damaged or broken swords. This forced Amakuni to make a perfect sword that would win the Emperor’s heart and ensure that the warriors won the battles. The Katana is often distinguished from many other swords by the fact that it sits blade edge (Ha in Japanese) up in its sheath, allowing the warrior to draw the Katana and slice his opponent with a single motion. In fact the art of drawing and cutting the Katana is known as Iaido. In pre-industrial Japan, the sword was not just a weapon but the soul of the Samurai. A samurai warrior was a loyal servant to his feudal lord or “Daimyo” until death parted them. The sword was more than just the weapon of choice for the samurai; it was a part of his identity. Each Japanese soldier had a collection of swords in his possession. A katana (long sword) and wakizashi (short sword) made up a Daisho set. The katana sword is considered as the deadliest weapon in Japanese history and culture. The wakizashi was considered as an emergency weapon which was to be carried everywhere the Samurai went. Although a Samurai was required to leave all his weapons outside the house, he had to carry his wakizashi in the house and keep it under the pillow. This small sword was used during emergencies, in close quarter combat or for ritual suicide. The warriors mainly used the katana swords during battles. The Samurai sword still carries a strong historical and ceremonial importance in Japan. In a samurai family the swords were so revered that they were passed down from generation to generation, from father to son. If the hilt or scabbard wore out or broke, new ones would be fashioned for the all-important blade. The hilt, the tsuba (hand guard), and the scabbard themselves were often great art objects.